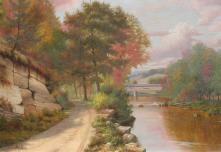 Best known for "trompe l'oeil" or highly realistic still life painting, especially hanging game, George Cope spent most of his life around the Brandywine River Valley in West Chester, Pennsylvania, although in the 1870s he traveled for four years to the Far West including the Pacific Coast and the Plains. Titles of his work included A Spur of the Sierra Nevada Mountains and Falls of the Turnchuck River, Washington Territory. He was an avid hunter and outdoorsman. Cope began his formal training in 1876 with German landscape painter Herman Herzog, but in 1887 switched to "trompe l'oeil" still lifes as his primary subject when he saw the success with this style of other artists such as William Harnett. This subject matter was new to the United States and was introduced in the mid 19th century by German emigre artists who had been much influenced by the Dutch still-life tradition. When Cope returned to Pennsylvania, he taught in a local school and produced paintings that were collected in Philadelphia by wealthy collectors, but after the turn of the century, he was largely forgotten. He died poor and neglected, with one of the reasons being that he continued into the 20th century as a trompe l'oeil painter, a style that became very outmoded. As he got more and more determined in the face of modernism to maintain precision, it is written that his later still lifes "are almost macabre in their staring, frozen, rigid exactitude"